It started with a pair of 17-year-old 200-hp Yamahas. Steve Johnson&apos;s friend would give him the outboards for free - on one condition. "He said, &apos;I&apos;ll give them to you if you cause a scene with them - you know, stir up some trouble,&apos; " says Johnson. 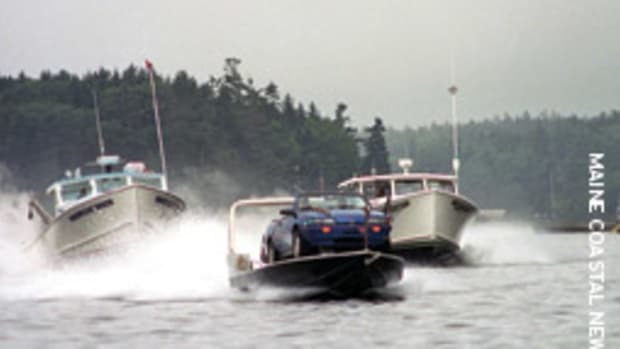 The "trouble" would take place on Maine&apos;s lobster boat racing circuit this summer. Notorious for concocting oddball vessels for the races, Johnson did not disappoint. Over a couple of beers last spring, he and his design team - a mix of lobstermen, fishermen and mechanic friends - decided to saw off the top of a 1973 26-foot Silverton, glass a deck over it, and strap a 1994 sapphire-blue convertible Pontiac Sunbird to it. Johnson, 54, named the vessel Ca&apos;-Boat. And it&apos;s a real boat - registered in the State of Maine, with navigation lights, GPS and a VHF radio. You operate Ca&apos;-Boat from the driver&apos;s seat ... of the car, that is. "We just made up a coupling and put a hydraulic steering pump on the end of the steering column," says Johnson, who has run his own business, Johnson&apos;s Boatyard on Long Island, Maine, since 1993. "We just had to run hydraulic hoses back from there. We put the shifter in where the console was. It turns beautifully, like a sports car." "We beefed up the stern to hold the outboards," says Johnson. About 450 boats from 12 to 46 feet participate each year in a series of lobster boat races held in such Maine ports as Rockland, Searsport and Stonington. There&apos;s been some mild grumbling by other participants about Johnson&apos;s Ca&apos;-Boat falling well outside the definition of a lobster boat, even though he has mounted a faux pot hauler on the port side. "Some guys have said that boat doesn&apos;t fish," says Jon Johansen, president of the Maine Lobster Boat Racing Association. "And I say, &apos;Yeah, well it generates interest in the races, and that&apos;s good.&apos; "
How will Johnson top the Ca&apos;-Boat? Word is he&apos;s trying to secure an Oscar Meyer Weinermobile. Read the full story in the October issue of Soundings. It's a car! No. It's a boat! No. It's both!